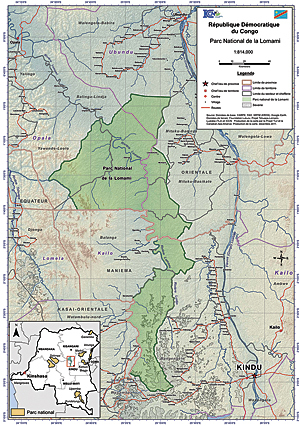 The creation of Lomami National Park is proposed in the Democratic Republic of Congo. GIS operation in the field allowed community participation in defining boundaries of the park. The digital basemap was built from the ground up in central Africa. Three rivers surround 40,000 square kilometers of mysterious forest in the heart of the Democratic Republic of Congo (DR Congo). Until very recently, it was unexplored. It has no airstrips; its paths are without bridges. No four-wheel vehicles can come even to the sparse settlements, which are limited to the area's periphery. In 2007, an expedition—made up of conservationists with experience from exploration and wildlife inventory in other parts of DR Congo—entered this forest situated between the basins of the Tshuapa, Lomami, and Lualaba Rivers. The TL2 project, as it is now known, was led by Lukuru Foundation researchers John and Terese Hart, who set out to survey large mammals and human activity and now are promoting the creation of a protected area in this, one of the world's last unexplored tropical forests. The lesula monkey (Cercopithecus lomamiensis), a new species of monkey documented by TL2 project researchers in the middle of Lomami National Park. The TL2 project mission is to build effective conservation, from a village base to national administration. It is a locally based project, built on the diplomatic and field experience of the Harts and a cadre of Congolese field biologists with whom they had worked on previous projects. More and more local people have joined the project, bringing the advantage of long experience in the forests, languages, and cultures of the TL2. Their combined observation and diplomatic skills are critical for the scale of coverage and tying results together to give the products needed for enduring conservation. Since 2007, these teams have surveyed the forest by walking over 5,000 kilometers of compass-directed inventory tracks. From the beginning of their surveys, the Harts sought GIS support to explore; document; and, eventually, define the area for conservation. An innovative partnership was developed in 2007 with Canadian Ape Alliance, a nongovernmental organization based in Toronto, Canada. Nick January, a volunteer GIS application specialist with the alliance, directs the collaboration with Lukuru's TL2 project through an Esri Conservation Grant, which has been generously supported since 2005. Fully equipped with multiple ArcGIS for Desktop, ArcGIS Spatial Analyst extension, and ArcPad licenses, the Harts are now able to capitalize on an existing mapping system that documents, stores, analyzes, and provides end products in support of their conservation efforts. The development of an accurate and comprehensive basemap—an essential tool—was a daunting challenge. How could the TL2 teams accurately map a proposed protected area in such a remote and inaccessible region of central Africa? It quickly became apparent that the available data was inaccurate and would have limited use for the scale of the TL2 project. For DR Congo, digital basemap data was restricted to widely distributed, publicly available national shapefiles (including transport, vegetation cover, river networks, political boundaries, protected areas, and elevation data). To successfully delimit the newly explored area, an early focus for the TL2 GIS was a complete overhaul of local geospatial data for the basemap. GPS field data from multiple reconnaissance surveys was being rapidly collected and added to a growing volume of TL2 data (spreadsheets, databases, KML files, field notes). This stream of invaluable data was collected on the comprehensive and collaborative Lukuru/Canadian Ape Alliance GIS platform for TL2. The TL2 contributors learned a routine for documenting, storing, maintaining, editing, and analyzing the geospatial data so that final cartographic products would become more sophisticated and precise for what had recently been unexplored, inaccessible forest. 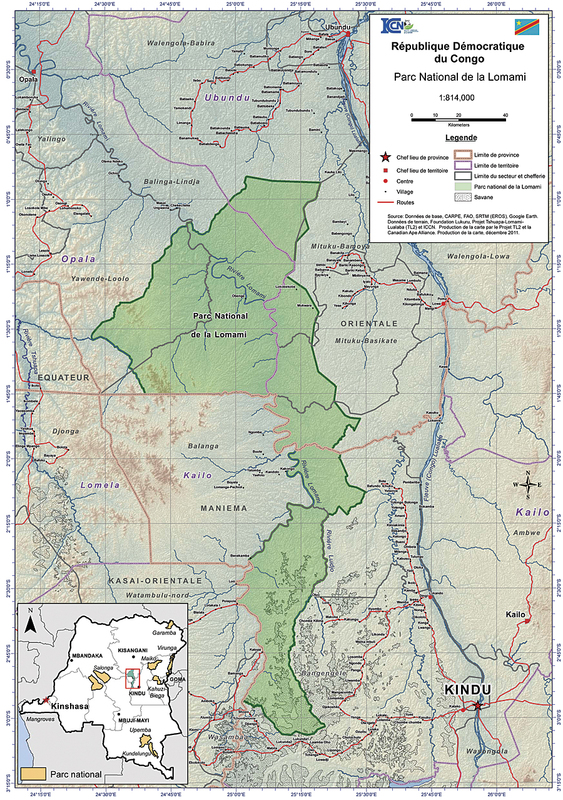 Proposed Lomami National Park, Democratic Republic of Congo. As TL2 field data became available, January worked on creating a more reliable basemap. To eventually get a delimited map of the proposed protected area, all map features needed to be digitized, including river networks, villages, and roads that had long since turned into footpaths. These were logical park boundaries. This background work included the use of Arc Hydro to create watersheds and drainage patterns, the incorporation of GPS field data to accurately map settlements, and the use of satellite imagery to further confirm location accuracy and content. Older maps and legal documents were used to correctly lay out internal political boundaries. The Esri Conservation Grant expanded as the TL2 project added staff and ArcGIS expertise. Esri's technical and administrative support from both US and Canadian offices became critical to the GIS operation. Not only was a smooth integration and analysis of volumes of field data from a variety of sources possible but so too was a seamless transfer to web-based platforms, such as ArcGIS Online. With Esri software licenses and training materials, it was possible to have multiple installations under dispersed field working environments despite many hardware malfunctions. In five years, the TL2 project has made important progress toward establishment of Lomami National Park. Exploration has led to the definition of boundaries for the remote park; these are delimited through the incorporation of GIS technology and Esri support. Surveys have resulted in previously undocumented populations of bonobo chimpanzees, okapis, elephants, monkeys, and Congo peacocks. 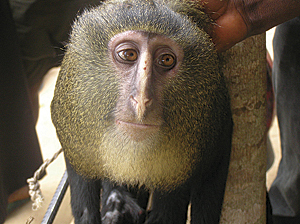 One of the most important discoveries of the TL2 project has been the documentation and confirmation of a new monkey species living in the park area, the lesula monkey (Cercopithecus lomamiensis), an event that garnered international attention for the species, as well as Lomami National Park. Once the park is officially established, the TL2 project will continue to monitor wildlife populations and hunting in the region. It will conduct conservation outreach programs in town centers, villages, and state capitals. The project will also train local people and students to protect, monitor, and promote conservation in Lomami National Park and in the DR Congo overall. With collaboration from the Congolese parks authority, outside experts will be able to visit and experience this extraordinary region and continue its exploration, documentation, and preservation. For more information, contact John A. Hart, PhD, scientific director, Lukuru Foundation, or visit bonoboincongo.com; contact Terese Hart, PhD, director, TL2 project, or visit www.bonoboincongo.com; or contact Nick January, GISP, Canadian Ape Alliance, or visit www.great-apes.com.